Although this may be it or a complete guess, found on Google! Actually... that might be it with the logo on top. Could be. But it could be just someones chop, with the official SFM logo. I will probably find out what the new Ferrari looks like tomorrow. there is no way that I'm going to stay up until the early hours of the morning just to see an unveiling of a new car. Here's some more news: I found a sneak preview on F1 Fanatics Blog! 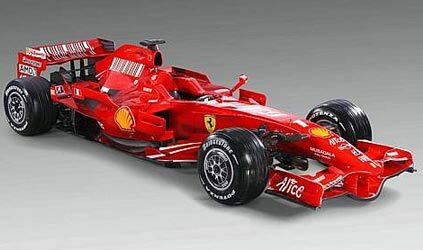 The Scuderia Ferrari F2008 Chassis has been released. (and this is brand new news as well, posted on a British site 3 hours ago! Apologies... it is WAYYY too small! Hmm... it looks pretty similar to last year's Ferrari. The front wing is different. Go on the F1 site. You'll be able to see it better. Hmm... I noticed that too, but there must've been a small improvement in the front of it. Oh well, the "we hate our cars, we like Ferrari's" team is next. Their MP4/23 will be launced as I speak in 2 days, 20 hours and 45 minutes in our time at 4:14 pm Melbourne time. Admin_Holden wrote: Hmm... I noticed that too, but there must've been a small improvement in the front of it. Oh well, the "we hate our cars, we like Ferrari's" team is next. There are differences compared to its predecessor outside and inside the car. I also just noticed that the walls for the tub are higher too. I think there might be a little bit of change to the rear wing as well. The intake looks different too. BTW I looked at it on TV (Channel 10 of course) and it is also a darker red. I already have a picture on the first page. The Panasonic Toyota Tf108 has been released, refer to the front page for pictures. Also, retired race driver Alexander Wurz has signed with Honda to be their test driver. 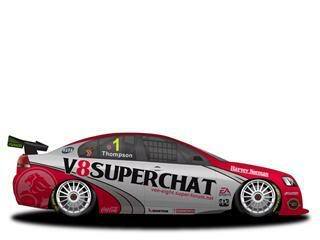 If you ask me, the livery looks like the 2002/2003 version. Yep, it does. I was actually gonna say that.